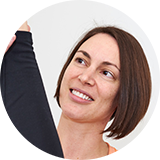 Sarah is the Principal Physiotherapist and Founder of The Studio. After graduating and commencing work in Private Practice, she soon undertook further training in Clinical Pilates and now has over 12 years experience in teaching Pilates and treating musculoskeletal issues. She has also completed AMTA courses in Lumbopelvic dysfunction and has a special interest in treating sacroiliac joint pain. Over the last 10 years, Sarah has also completed multiple Anatomical Dry Needling courses and is experienced in using Needling to help treat muscular conditions. More recently, she has undertaken further education in Nutrition and has a keen interest in this area and how it relates to inflammatory conditions and pain. Alicia has been part of The Studio Team since 2012, and is currently on Maternity leave with baby number two. She has completed her Pilates, Dry Needling and Mulligan's qualifications, as well as course work in treatment of TMJ (jaw) disorders. Last, but certainly not least, is our resident chocolate labrador Kodi. She provides emotional support to those in need. She is a great listener and knows how to make you smile.